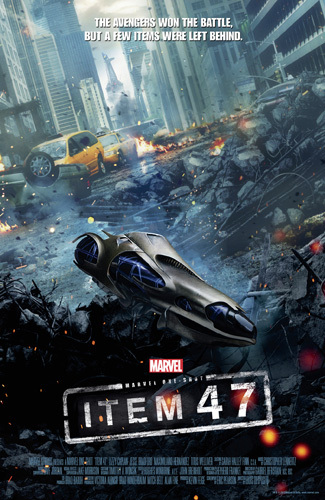 For weeks we have been teased with hints and bits from Marvel's short film Item 47 a spin off from The Avengers or Avengers Assemble universe expected to be available on the upcoming home release of Avengers Assemble . Today they released a clip from Item 47 and it can be seen below. S.H.I.E.L.D. recovered all but one... a Chitauri weapon, aka "ITEM 47." After a young couple, Benny (Jesse Bradford) and Claire (Lizzy Caplan), stumble into finding the elusive weapon, they embark on a bank robbing spree. With S.H.I.E.L.D. agents (LOST's Titus Welliver and AVENGERS's Maximiliano Hernandez) hot on their trail, it's only a matter of time before the couple have to pay for their crimes. The new Marvel One Shot Item 47 available with Avengers Assemble on Blu-ray, 17th September in the UK. With New York City in ruins following the epic climax to Marvel Avengers Assemble, certain alien technology was left behind.